Previous CDs by Dominic Duval on Leo Records (Navigator and The Alexander Suite) received outstanding reviews. 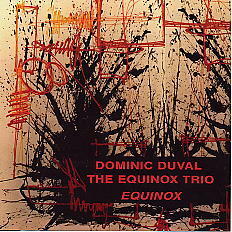 The Equinox Trio with Tomas Ulrich on cello and Michael Jefry Stevens on piano adds another dimension to his recording output. "What makes this output so remarkable, though, is not its sheer volume, but its quality and diversity" (Stuart Broomer - liner notes).